What's Mummy Up To ...: Tutorial: Hannah Needs a Santa-Sack Too! I have fond memories of my childhood Santa-sack, which was really just a store-bought Christmassy-looking pillowcase-style sack. I love the memories of excitedly laying out my Santa sack in the lounge-room on Christmas Eve, then waking bright and early on Christmas morning and investigating to see what I might find inside ... so much fun, huh! So for Bethany's first Christmas, I decided to make her a Santa sack. When I was designing it in my mind I decided I wanted it Christmassy, but not in traditional Christmas colours. 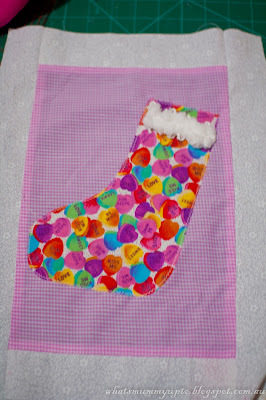 At the time I was experimenting with green, pink and red as a potential colour-scheme for Bethany's "big-girl room", and decided I'd go with that for the Santa sack too. So last year, for Hannah's first "real" Christmas (she was born on the 23rd December, so spent her first Christmas mostly asleep at the hospital with Mummy!) 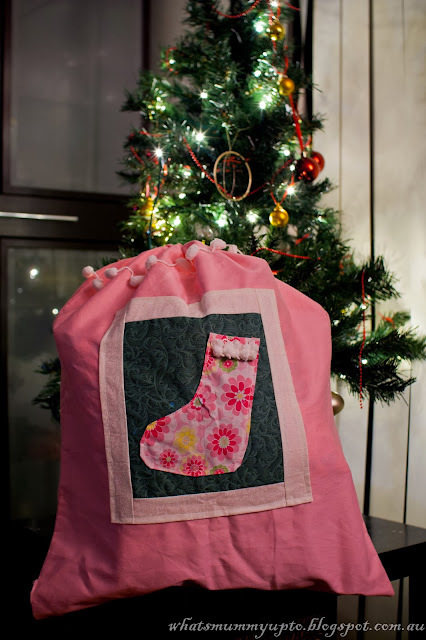 I realised I really needed to make a Santa sack for Hannah too. Ha ha ... any excuse for a sewing project, hey ... especially in the midst of all the other things that need doing just before Christmas. 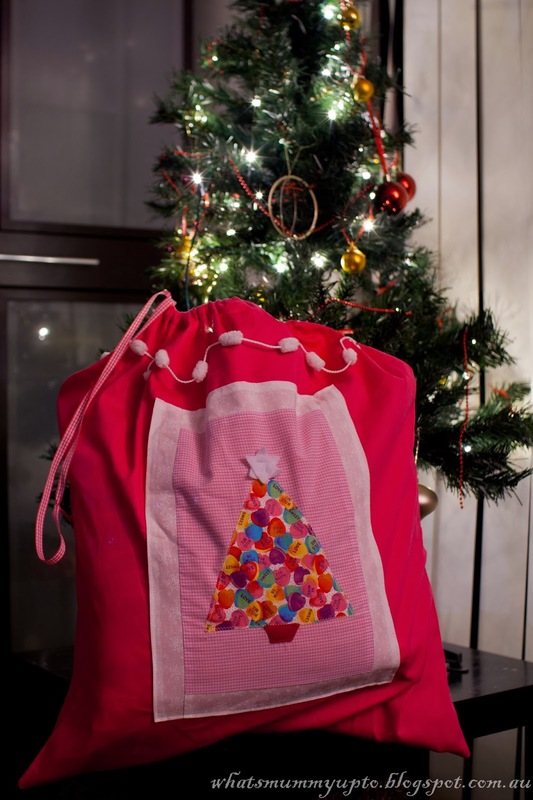 I decided Hannah's Santa-sack had to be different to Bethany's so that they could easily tell them apart, but not so different that Bethany would feel like Hannah's was better and she had been left with a dud - my sewing has definitely improved A LOT since I made hers. After a bit of thought, I decided I would make exactly the same design, just in different colours. 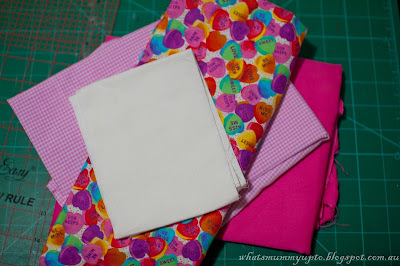 I went to spotlight and found some dark pink cotton drill, then came home and rummaged through my scrap fabrics for coordinating colours. This is what Hannah ended up with ... I like it! 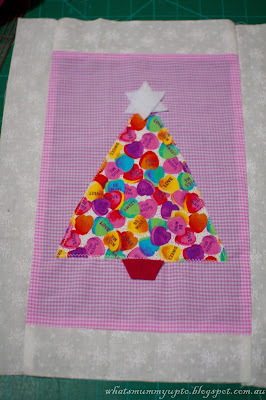 Anyway, I think a Christmas project like this is a really simple idea, but also a bit special 'cause Mummy has made it especially for her girls. I'm kinda hoping my girls are as sentimental as Mummy is and may actually like to keep these types of things as keepsakes to show their kids. So, I thought I'd share how I made it in case anyone wants to have a go. I had planned to post this last Christmas, but you know how it is ... Christmas had been and gone, and I hadn't gotten around to it, so ended up saving it for this year ... with hopefully enough time for people to get one made before the big guy comes down the chimney. I also think these would make a great gift for a new baby who is about to experience their very first Christmas!! 1. From the backing fabric for your block …. mine was some pink gingham … cut out 2 rectangles of equal sizes. Mine were 12 inches by 9 inches, but really you can make them as big as you like as long as they fit on your sack. 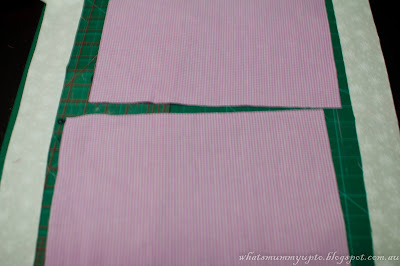 Then cut 1 or 2 strips of coordinating fabric, 2 inches wide and as long as you can get. These are for the borders. 2. 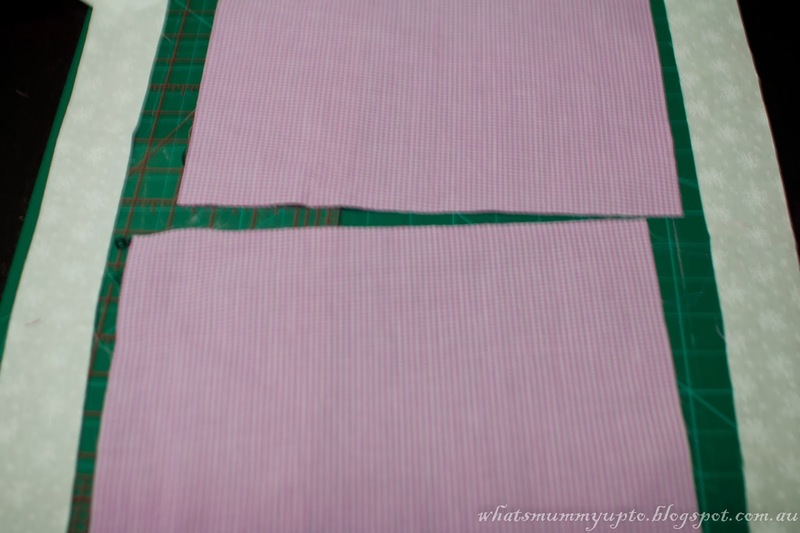 Measure your strips along the short sides of the backing fabric, like so, and cut to length. Then sew them right sides together along the top and bottom of your backing fabric. 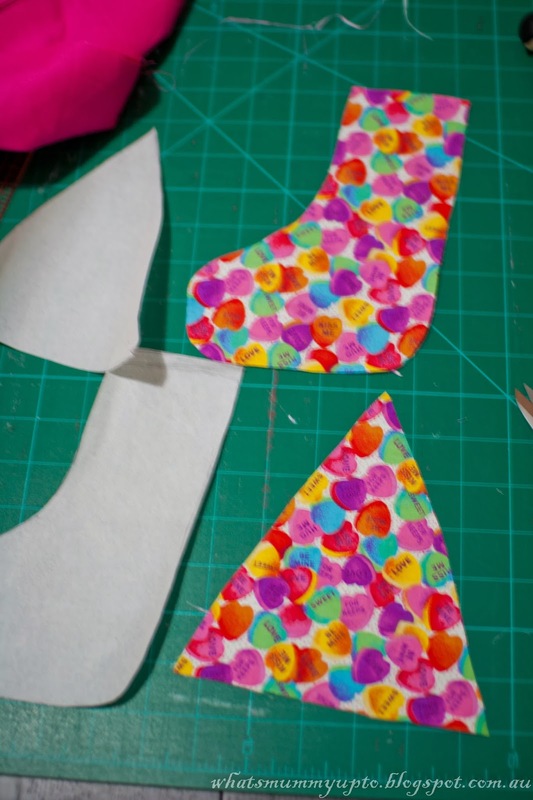 Open them out and iron the seam flat. 3. 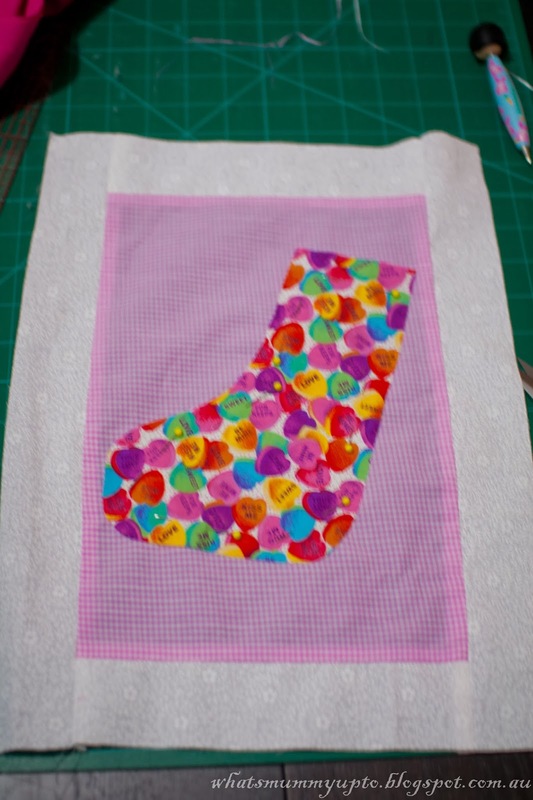 Measure your strips along the long sides, including the extra length made by the top and bottom borders, then sew right sides together, open them out and iron them so you end up with this…. 4. Repeat for the other block. 5. 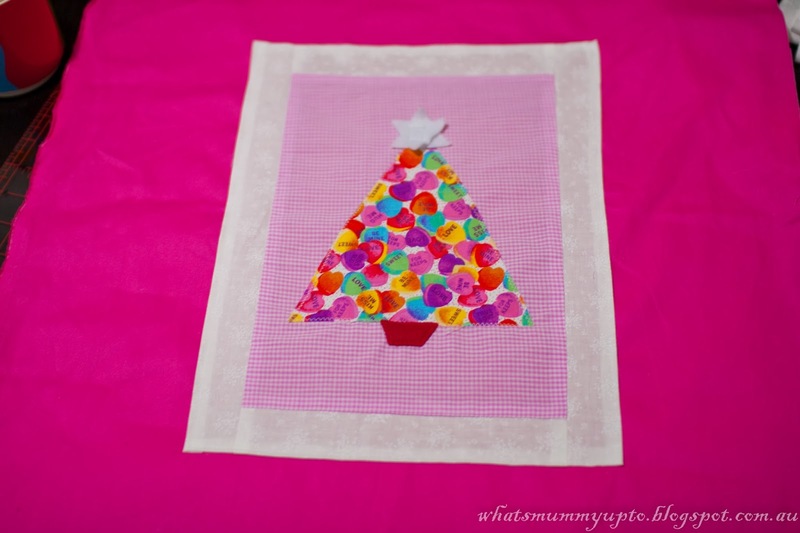 For the appliquéd pictures, of course you can choose whatever christmassy shape you'd like. 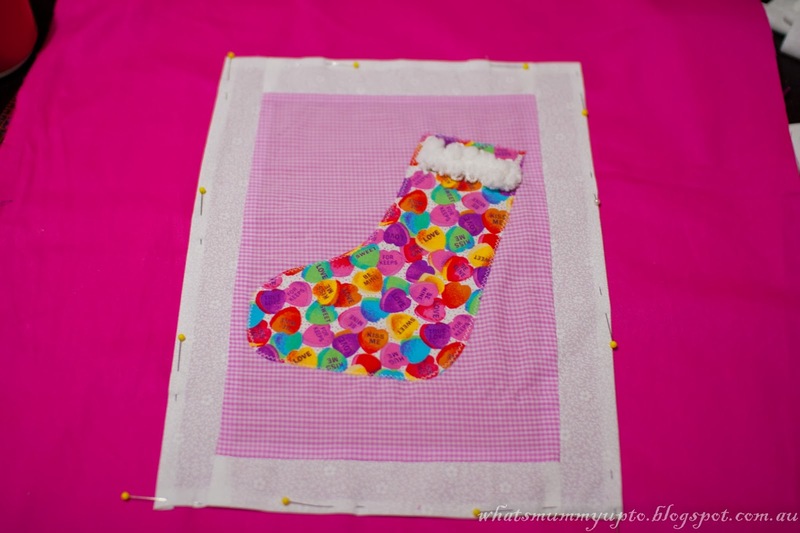 I went for a stocking on one side, and a Christmas Tree on the other … basically because these are super easy to draw free-hand. 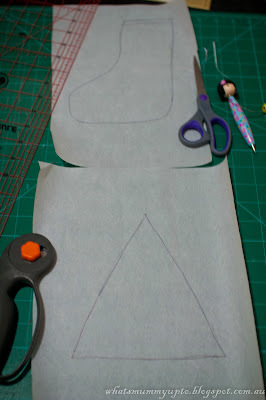 So, grab some paper … I used baking paper … and draw your appliqué shapes. Just make sure you draw them small enough to fit onto the middle section of your backing blocks. 7. Place the shapes onto your blocks like so, and pin generously to hold them in place. Then sew carefully around the very edge of your shape, using a small zig-zag stitch to appliqué them in place. Repeat with your other shape. 9. 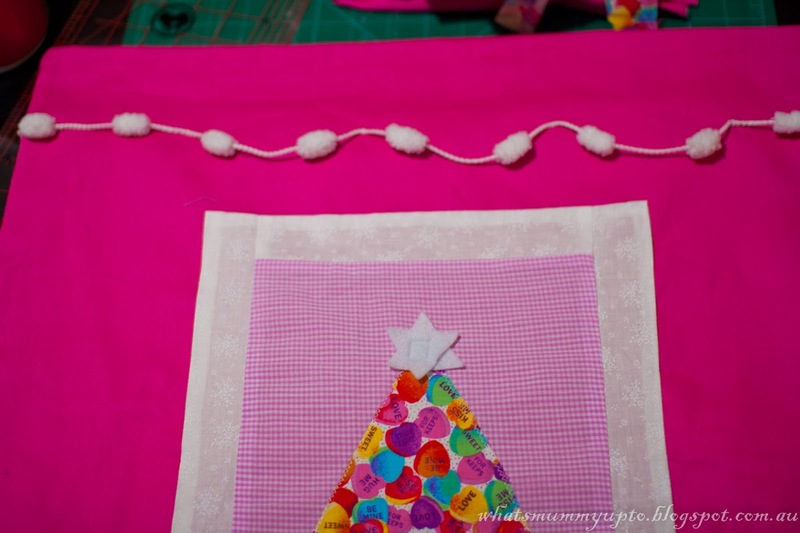 Now for the Christmas Tree, I sewed on my triangle then used a piece of red felt shaped like a trapezium (that's what that shape is, isn't it?… geometry was not my strong-point!) to make a trunk/stand. 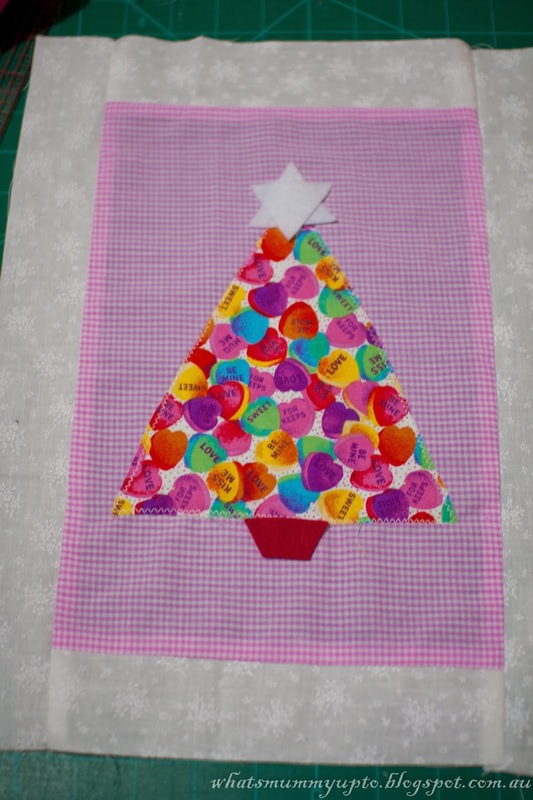 I then used 2 small triangles of white felt placed upside-down on top of each other to make the star at the top of the tree. I simply zig-zagged around the edges of each of these felt shapes. 10. 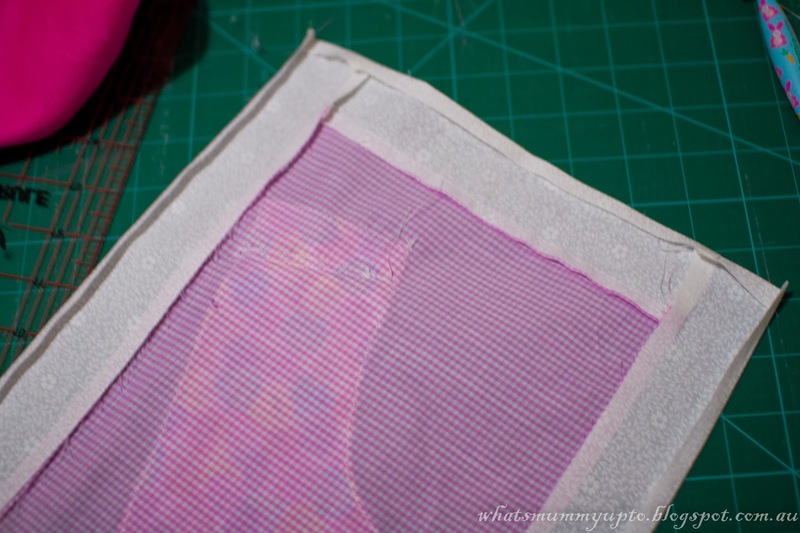 Now flip your completed blocks over to the back, and iron the raw edges under 1/4 inch all the way around and set aside for a minute. 11. 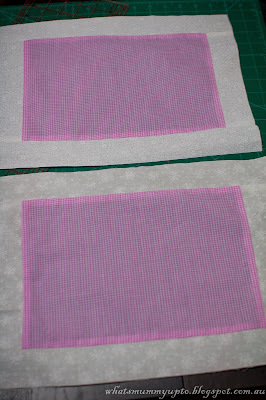 For the sack itself, I used cotton drill fabric, and I cut it into 2 rectangles by folding the fabric selvedge to selvedge, then cutting down the fold (which gives you 2 pieces, a front and a back). I then cut each rectangle to 1 meter / yard long. (Sorry I didn't take a pic of that step, but basically you end up with 2 big rectangles. 12. Grab your blocks, and pin right-side-up to the right-side of the drill fabric. Try and centre it as best you can. Then pin it down making sure all the ironed raw edges are tucked in. Sew carefully around the edge, approximately 1/8" from the edge, using a straight-stitch. 13. 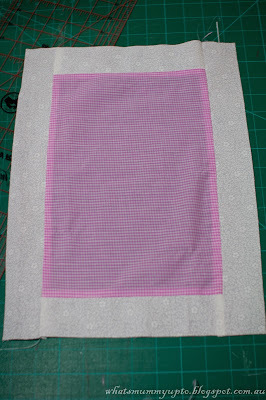 Repeat with the other block on the other large sack rectangle. 14. 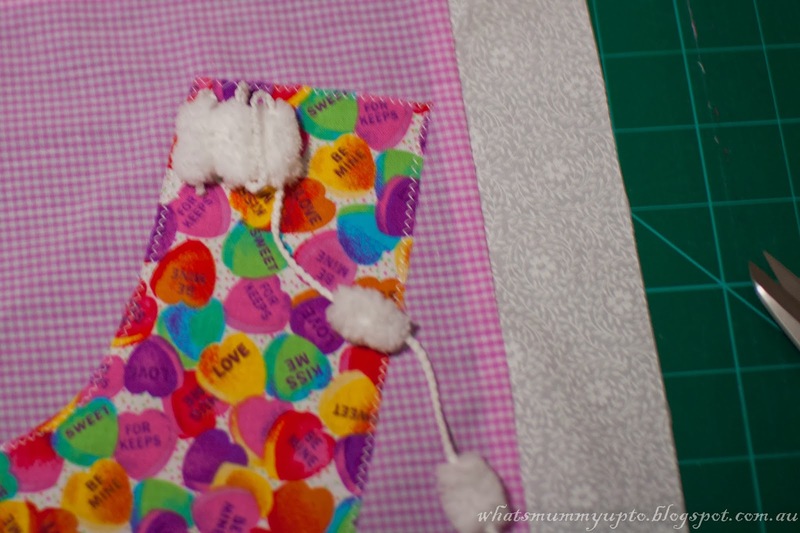 Now place your two sack pieces right sides together (make sure you have them up the right way so you don't end up with an upside-down picture on one side!!). Pin around the 2 sides and bottom of the sack, then sew with a straight stitch using a seam allowance of approximately 1/2 inch. 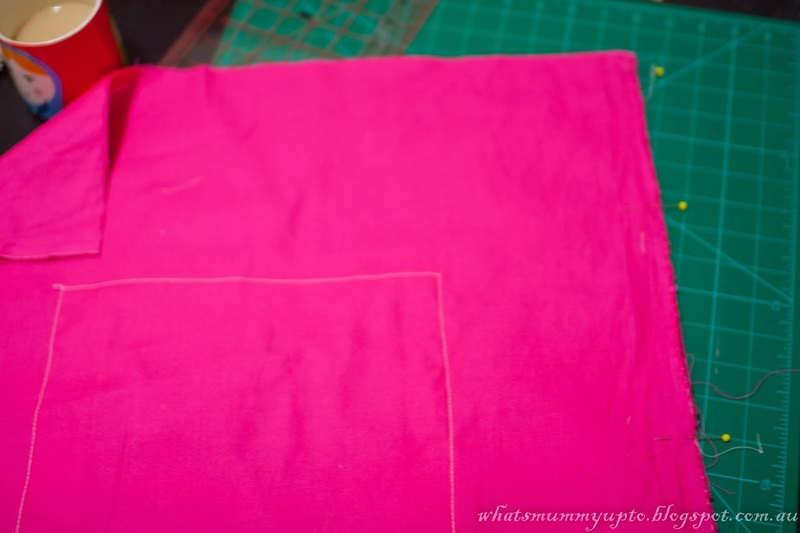 You can then finish off the raw edges using an overlocker (serger) or with a zig-zag stitch. 15. Turn the sack right-side-out, then iron all the seams. 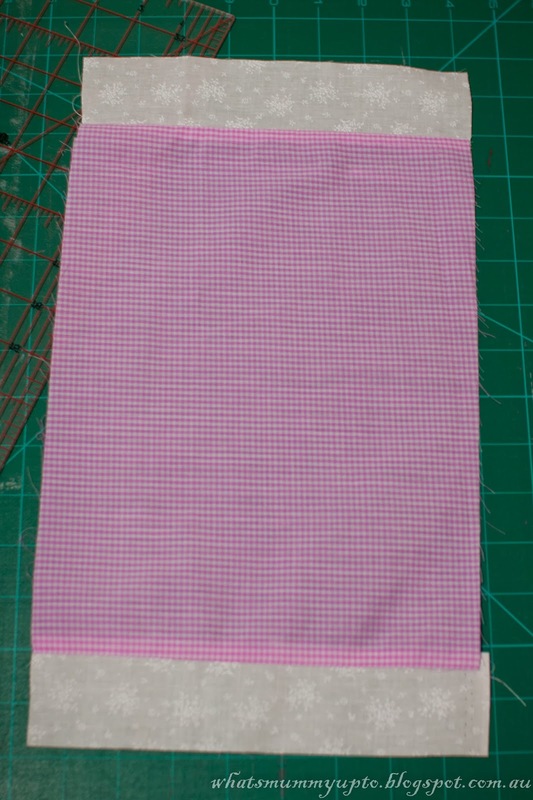 Open the top of the sack, and turn down the raw edge by 1/2", then by 3/4" all the way around. Iron, then pin in place, like so! 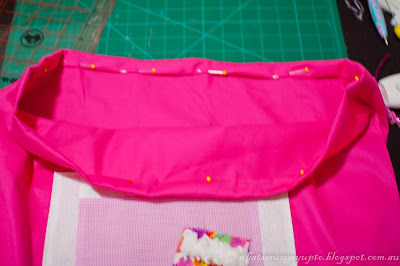 Then sew using a 1/8" seam allowance to make sure there is enough room for your draw-string. Make sure you leave a gap of about 1 inch at the end of your stitching, to allow space for threading your draw-string. 16. You might want to embellish the sack further. 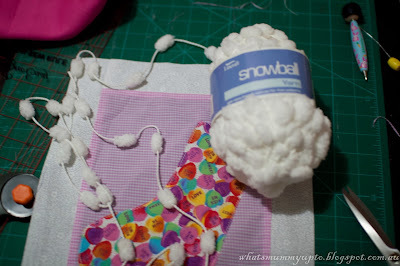 I thought a row of this Snowball yarn sewn by hand around the top of the sack was a cute touch. 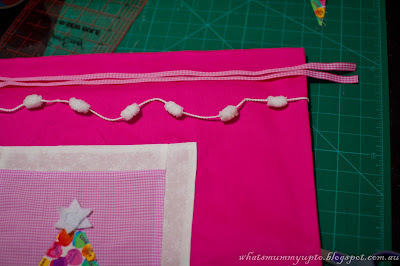 Another gorgeous idea would be to appliqué, sew or even paint the child's name across the top of the sack. How cute would that look!! 17. 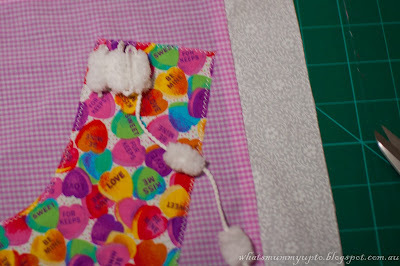 Next measure your ribbon / cord across the top of your sack, then fold back and across the sack again like so. Let the ends overhand about 2-3" like so to allow space for tying, then cut to length. 18. 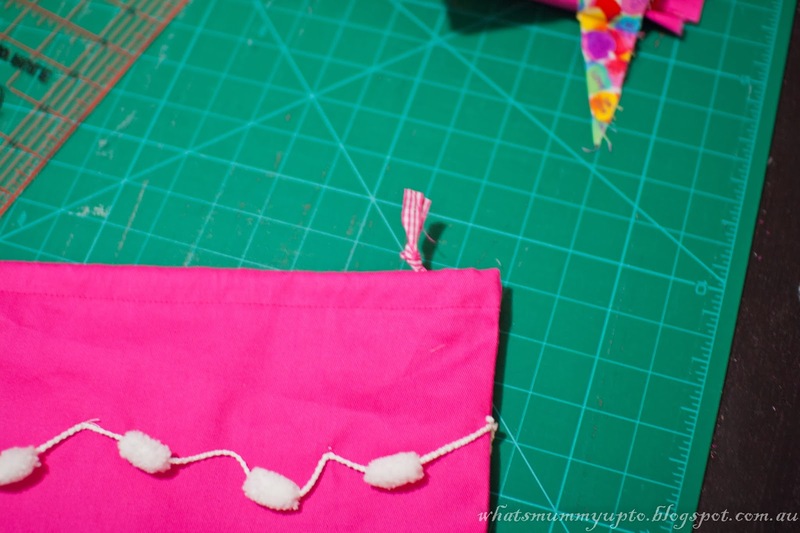 Using a safety pin, thread the ribbon/cord through the gap you left in the top hem, then tie the ends of the ribbon/cord together like so. 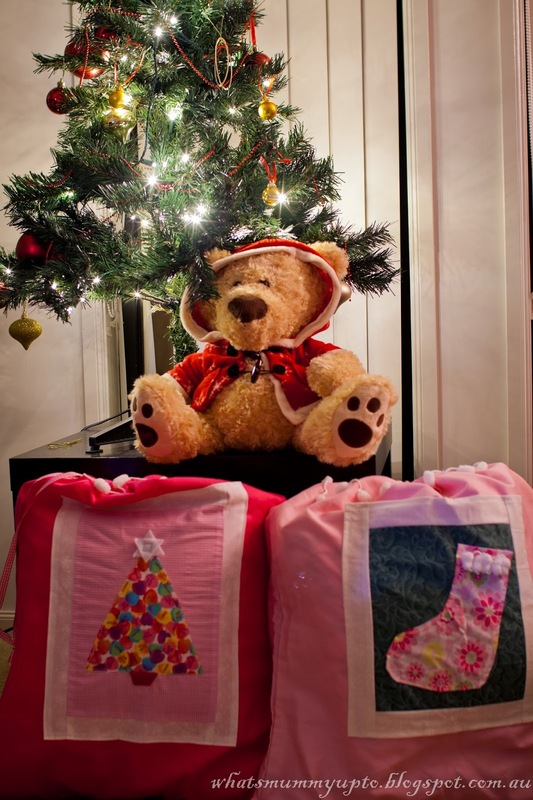 And there you have it … a special santa-sack, for a special little person. 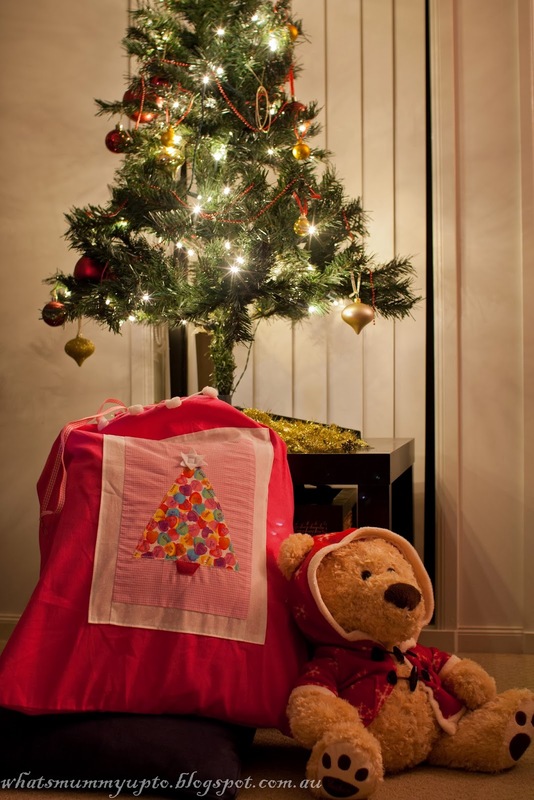 Hmmm, I wonder what Santa will leave inside this year! Oh, and if you make one, I'd love to see it! Feel free to email me any time with a pic! Thanks Irene … do it! !